Best Seller Publishing announces the release of Danielle Formaro’s new book “Add THIS to Your Plate! 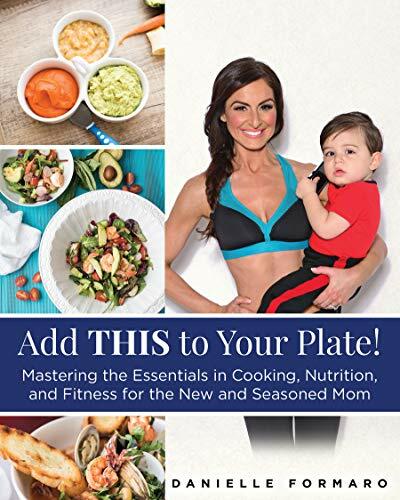 : Mastering the Essentials in Cooking, Nutrition, and Fitness for the New and Seasoned Mom.” It will be available for free download in the Amazon Kindle Store for one more day on March 22nd. Moms are constantly piling new things to their plates; if not in their minds, then literally on our plates—hence the dreaded mommy weight gain. As their to-do lists continue to grow, they always (somehow) ﬁnd a way to add even MORE to their smorgasbord of STUFF. It just never ends. Once upon a time, it was enough that women ran the household and raised the children—now they have added so much more to their plates. Women now have more roles than a French bakery. Juggling it all can be tough, but if you have the right recipe for success, you will be able to juggle it all. “Add THIS To Your Plate” offers the new mom solutions on how to handle it all. It provides over 100 healthy recipes , half dedicated to baby and the other half dedicated to the rest of the family. The baby recipes start at ages 4-6 months and continue to grow in age until baby reaches age one. Recipes for the baby’s plate start with baby’s ﬁrst cereals, purees, mixed purees, and then end with exciting and ﬂavorful chunky style meals. Once the recipes reach 12 months of age, baby can then enjoy the next 50 recipes created for the whole family. Family recipes are classic recipes we have all grown up to love, but lightened up to add more nutritional value and also aid in weight management. All recipes have a nutrition based or fun fact to creating for some interesting conversation starters during meal time. “Add THIS To Your Plate” also educates new moms on kitchen basics, covering basic tools and appliances, pots and pans, and even common culinary jargon. Mom will also learn the importance of cooking with the appropriate oils, how to take meat temperatures for a perfect roast, and how to follow important safety tips in the kitchen. Along with learning how be a chef successful chef in her own kitchen, mom will also have the opportunity to do a giver herself a little attention by reading useful topics on effective time management, personal development, nutrition, meal prepping and planning, and weight loss. She will even be provided with sample meals plans to assist her even further. “Add THIS To Your Plate” is a one stop shop for new mom’s overwhelmed with where to begin in this new journey called Motherhood. In no time the inexperienced cook will become a chef, and the frazzled new mom will feel conﬁdent as she jumps back into the saddle again. Meal plans and how to calculate your caloric baseline for weight loss and maintenance in also included. “Add THIS to Your Plate!” by Danielle Formaro will be free and available for download on Amazon for 1 more day (03/22/2019) at: https://www.amazon.com/dp/B07NQ164VB. “It’s simply one of the greatest cook books out there! Recipes are delicious, easy to follow, and very well written. Whether you are a chef or a newbie in the kitchen it’s simply amazing! Makes for a great gift for a baby shower, bridal shower or any occasion. 5 stars all around!” – Isabel T.
For more questions or to schedule an interview about this press release please contact us at (626) 765-9750 or email info@bestsellerpublishing.org . Best Seller Publishing is a Los Angeles Publishing Company dedicated to helping business owners and entrepreneurs become “the hunted” with their best-selling books. Danielle Formaro is a mother and entrepreneur. She graduated from Syracuse University in 2001 with a Bachelor of Science. She has been working in the restaurant and hospitality business for twenty-two years with the last ten years dedicated to special event management. In 2010, she opened a French restaurant called Central Bistro, located in the heart of downtown Boston. Danielle is an AFFA certified fitness professional. In 2012, she successfully launched a fitness business, offering lifestyle, nutrition, and coaching to new and seasoned moms. Danielle is also a published Author. Along with children’s books, Danielle is also actively writing new and exciting personal development, fitness and family cookbooks. Danielle currently resides in her hometown of Burlington, Massachusetts, with her son, Giorgio.